Hello world and hello Diary Ng Panget Fans. So VIVA has released a movie version of the popular wattpad novel and fans are going crazy. I don't know why cause I haven't read the wattpad version and haven't seen the movie yet, but maybe the story is just so nice that it has reached this level that it has already made it to the movie industry. 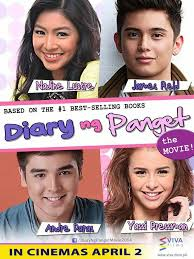 The movie "Diary Ng Panget"(An Ugly's Diary) has been on showing to theaters in the Philippines since April 2, 2014. Now the casting is very interesting because most of them are not the common faces that we see in Philippine television. I mean, they're not that really big stars. If you've already watched the movie or seen the promotions on televisions and posters or billboards, you'll somehow be asking how tall either one of the casts is, especially Andre Paras and James Reid, and that is why this writing is here and why you are reading this now. So we've made a table below about the casts height for you to see. There you go guys. Hope this post enlightened your minds. Please do LIKE us on Facebook. Chow!